As we’ve not upgraded Replay since summer 2014, we’ve jumped up a couple of versions. New recordings will no longer require Microsoft Silverlight to view – they will use either HTML5 or the Flash player, depending on your browser. Recordings made prior to today will still require Silverlight in the short term, and the editor still requires Silverlight as well. Important To move away from requiring Silverlight when viewing sessions, none of the currently installed recorders will work with this version. PCs in central teaching rooms are being updated. If you have the recorder installed on an office computer/laptop, you will be prompted to upgrade your recorder the next time you log in. 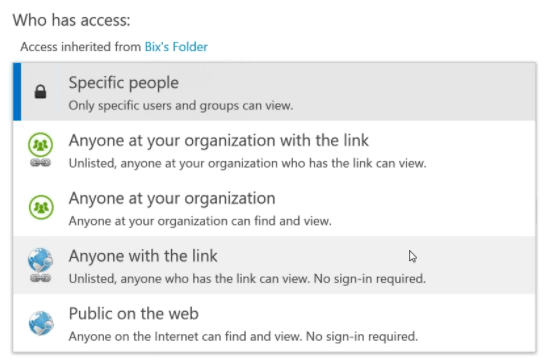 Those without admin rights will need to contact the IT Helpdesk for the new version. Previously, the list of sessions in Blackboard was pretty basic. Now, you’ll get access to the same tools as if you’d visited replay.aston.ac.uk directly. This includes things such as search, where Panopto will search for occurrences of words on slides/screen, and thumbnails of each session. Instructors are also able to manage and edit their sessions from here as well. You may see the old style building block if a) you’re running an out of date version of Internet Explorer or b) you’re in a Blackboard course which has access to more than one Panopto folder. 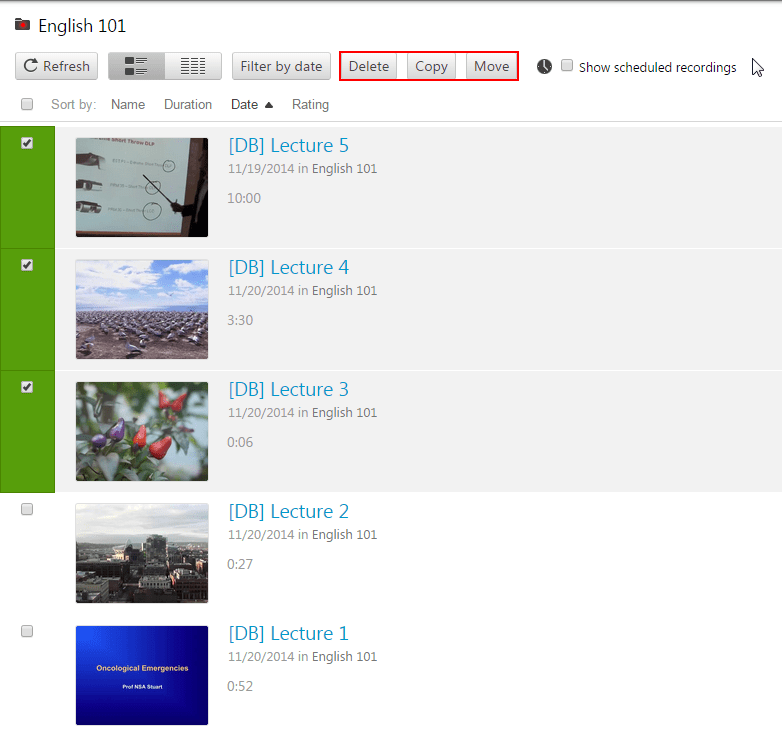 Instead of having to copy/move/delete sessions one at a time, check the boxes in the folder view and copy/move/delete in one go. When viewing/downloading statistics, you can now choose a specific date range. 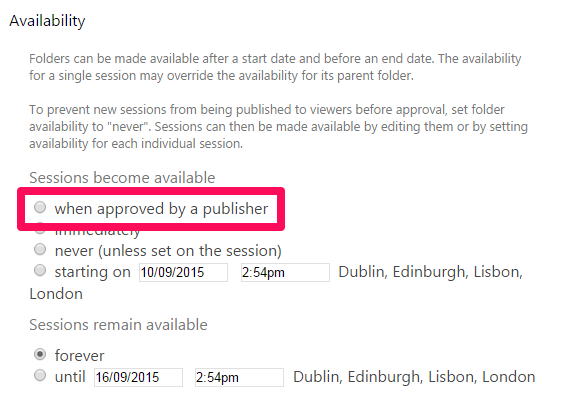 When choosing availability, you can now set a folder to require sessions are first approved by a nominated user. For example, you could use this when recording conference sessions that were publicly available but the organiser needs to check the recordings beforehand. We’ve been able to do this for a while, however some of the possibilities were hidden through different settings. Now it is a lot easier to choose. We’ll be updating the documentation over the next couple of days, and if you have any questions about any of the new features you can get in touch with replay@aston.ac.uk. 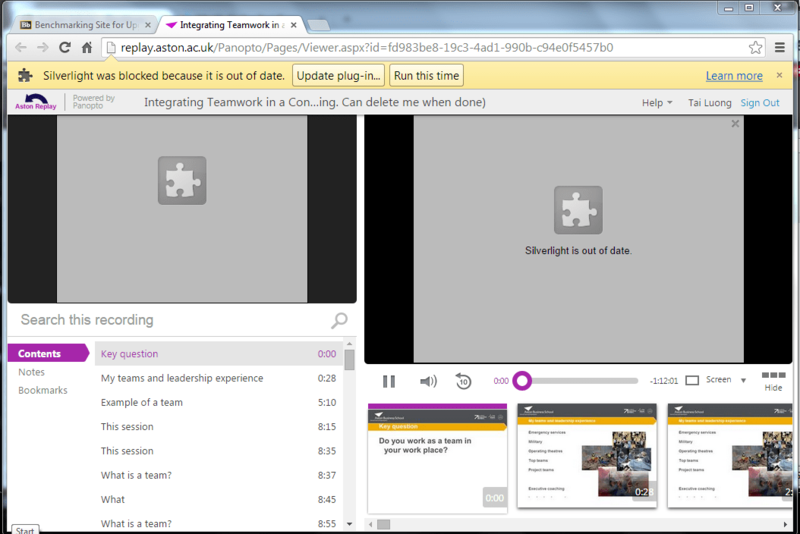 New for the 2015 academic year, we’ll be moving Aston Replay onto Panopto’s hosting service.